Haq's Musings: Middle Class Clout Rising In Pakistan. 1. Nafisa Shah, an upper middle class candidate of the PPP, defeated Pir Pagara's son in Khairpur. 2. 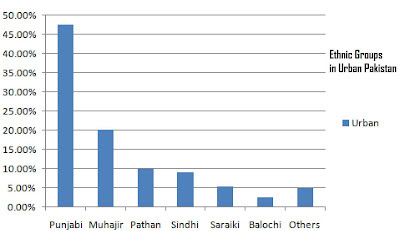 In Jhang, ten out of eleven of those elected are from the middle class rather than the families of the usual feudal zamindars. This would have been unthinkable ten years ago. 3. Some of the most benign feudal lords suffered astonishing electoral reverses. Mian Najibuddin Owaisi was not just the popular feudal lord of the village of Khanqah Sharif in the southern Punjab, he was also the sajjada nasheen, the descendant of the local Sufi saint. Because of Najibuddin's personal popularity, his vote stood up better than many other pro-Musharraf feudal lords—and he polled 46,000 votes. But he still lost, to an independent candidate from a nonfeudal middle-class background named Amir Varan, who received 57,000 votes and ousted the Owaisi family from control of the constituency for the first time since they entered politics in the elections of 1975. 4. PML (N) led by Nawaz Sharif and MQM swept the urban vote in Punjab and Sindh respectively. Both parties have their power bases in the urban middle class. 5. The PPP's voter lives in a different world, a world that was dominant up to a decade ago. It is a world that is much more rural, more deferential, more rooted in tradition. Its nationalism is less marked and its Islam less influenced by the international trends of the last 30 years and thus much less politicized and much more based in centuries-old Sufi traditions. Describing this situation, Jason Burke of the Guardian argues that "This is a Pakistan that is disappearing". Burke goes on to say that a PPP candidate in rural Punjab recognized it telling him that his party needed to "re-invent itself". While many rural residents in Sindh and Southern Punjab who voted for the PPP have remained relatively isolated from major developments in Pakistan in the last decade, the urban middle class has grown dramatically in numbers and influence during the military rule of President Musharraf. The New York Times reported on this expansion of Pakistani middle class last November in these words: "As he fights to hold on to power, General Musharraf finds himself opposed by the expanded middle class that is among his greatest achievements, and using his emergency powers to rein in another major advance he set in motion, a vibrant, independent news media". Acknowledging this fact, William Dalrymple, a British journalist/author considered knowledgeable about India and Pakistan, recently wrote as follows: "It was this newly enriched and empowered urban middle class that showed its political muscle for the first time with the organization of a lawyers' movement, whose protests against the dismissal of the chief justice soon swelled into a full-scale pro-democracy campaign, despite Musharraf's harassment and arrest of many lawyers. The movement represented a huge shift in Pakistani civil society's participation in politics. The middle class were at last moving from their living rooms onto the streets, from dinner parties into political parties." In 2007, analysts at Standard Chartered bank estimated that Pakistan has a middle class of 30 million which earns an average of about $10,000 per year. And adjusted for purchasing power parity (PPP), Pakistan's per capita GDP is approaching $3,000 per head. By enlarging and enriching the middle class in Pakistan, President Musharraf has unleashed the forces that he can not control. In some ways, this situation is similar to the Soviet leader Mr. Gorbachev's perestroika that eventually led to the rise of democracy and capitalism in Russia and many of the former Soviet republics. The fact that this enlarged, enriched and energized middle class is beginning to assert itself in Pakistani politics is a welcome change. Democracies depend on the existence of large, powerful middle class for their sustenance. If the size, influence and participation of the middle class in Pakistani politics continue to grow under the new government, it will only strengthen democratic institutions and the rule of law in the country. I may be wrong but, isn't Nafisa Shah the daughter of Syed Qaim Ali Shah. Hardly a middle class family. I guess you're right. But it's all relative in the context of Sindh. She's probably middle class compared with Sadruddin Shah, the son of Pir Pagara, who she deafeated. At least that's what William Dalrymple thinks of her in his reporting from Pakistan. Qaim Ali Shah's daughter Nafisa Shah is an Oxford graduate, and was a prominent human rights activist and journalist when, in 2001, she successfully contested the elections for the Khairpur district Nazim, after the Pakistan People's Party nominated her for the seat. While external debt increased from $39bn in 1999 to $50bn in 2009, poverty levels have fallen by over 10 per cent since 2001. Indeed, there are now around 30 million Pakistanis who are considered to be in the middle class with an average income of $10,000 annually, while some 17 million are now bracketed with the upper and upper-middle classes. Even though this does not approach China’s and India’s spectacular progress in this period, it does represent a solid advance. If one factors in the political turmoil the country has gone through, together with its ongoing insurgencies in the tribal areas and Balochistan, Pakistan’s progress has been impressive by any standard. Often, perceptive foreigners spot social trends that escape us because we are too close to them to see the changes going on around us. For instance, Burke identifies the shift away from English, and sees ‘Mehran man’ as urban, middle class and educated outside the elite English-medium system. He sees Muslims being under attack from the West, and genuinely believes that the 9/11 attacks were a part of a CIA/Zionist plot. Actually, my experience is that many highly educated and sophisticated people share this theory. Huma Yusuf blogs for Pakistan's Dawn.com site in Karachi and is a close watcher of new media in Pakistan. She says that in her country, new media has spawned a pithy brand of citizen journalism. The reason: “unlike Indians, we feel like we’re in a state of war”. She says that during the Pakistan Emergency of 2006-7, Pakistan’s online population grew from 2.5 million to 18 million. Click here for an MIT media labs paper she published on activism by Pakistan's online population. An ADB report on Asia's rising middle class released today confirms that Pakistan's middle class now is 40% of the population, significantly larger than the Indian middle class of about 25% of its population. The other significant news reported by Wall Street Journal today says the vast majority of what is defined as India's middle class is perched just above $2 a day. Most of this middle class growth in Pakistan occurred on Musharraf's watch. In Mr. Dasti’s area, one of the hardest hit by the recent flooding, the state has all but disappeared. Not that it was ever very present. In the British colonial era, before Pakistan became a separate country, the state would show up a few times a month in the form of a representative from the Raj dispensing justice. Later, the local landowner took over. For years, feudal lords reigned supreme, serving as the police, the judge and the political leader. Plantations had jails, and political seats were practically owned by families. Instead of midwifing democracy, these aristocrats obstructed it, ignoring the needs of rural Pakistanis, half of whom are still landless and desperately poor more than 60 years after Pakistan became a state. But changes began to erode the aristocrats’ power. Cities sprouted, with jobs in construction and industry. Large-scale farms eclipsed old-fashioned plantations. Vast hereditary lands splintered among generations of sons, and many aristocratic families left the country for cities, living beyond their means off sales of their remaining lands. Mobile labor has also reduced dependence on aristocratic families. In Punjab, the country’s most populous province, and its most economically advanced, the number of national lawmakers from feudal families shrank to 25 percent in 2008 from 42 percent in 1970, according to a count conducted by Mubashir Hassan, a former finance minister, and The New York Times. Mr. Dasti, a young, impulsive man with a troubled past, is much like the new Pakistan he represents. He is one of seven siblings born to illiterate parents. Despite his claims of finishing college, he never earned a degree, something his political opponents used against him in court this spring. One of the 35 criminal cases against him is for murder, a charge he said was leveled by his political opponents. Detractors accuse him of blackmailing rich people in a job at a newspaper. He said he was writing exposés. Observing the high levels of political instability plaguing countries in the developing world during the 1950s and '60s, Mr. Huntington noted that increasing levels of economic and social development often led to coups, revolutions and military takeovers. This could be explained, he argued, by a gap between the newly mobilized, educated and economically empowered people and their existing political system—that is, between their hopes for political participation and institutions that gave them little or no voice. Attacks against the existing political order, he noted, are seldom driven by the poorest of the poor in such a society; they tend to be led, instead, by rising middle classes who are frustrated by the lack of political and economic opportunity. Indeed, there is some reason to believe that the middle class in China may fear multiparty democracy in the short run, because it would unleash huge demands for redistribution precisely from those who have been left behind. Prosperous Chinese see the recent populist polarization of politics in Thailand as a warning of what democracy may bring. The fact is that authoritarianism in China is of a far higher quality than in the Middle East. Though not formally accountable to its people through elections, the Chinese government keeps careful track of popular discontents and often responds through appeasement rather than repression. Beijing is forthright, for example, in acknowledging the country's growing income disparities and for the past few years has sought to mitigate the problem by shifting new investments to the poor interior of the country. When flagrant cases of corruption or abuse appear, like melamine-tainted baby formula or the shoddy school construction revealed by the Sichuan earthquake, the government holds local officials brutally accountable—sometimes by executing them. It is the paradox that puzzles everybody: the headline numbers indicate an economy in an abysmal state, but everywhere one looks, there are people shopping like there is no tomorrow. How is this possible? An analysis conducted by The Express Tribune reveals a surprising answer: women. While the headline GDP numbers suggest sluggish economic growth, not all sectors are underperforming. A closer look suggests that the economic slowdown has been far from uniform, with some sectors booming, while others are in a deep slump. The retail and wholesale sector in Pakistan was worth about $40 billion in fiscal year 2012, and has been growing at 5.3% in real (inflation-adjusted) terms for the past five years, much faster than overall economic growth during that period. And the benefits of this growth have been visible throughout the country. While large shopping malls opening up has become common place in cities like Lahore and Karachi, national newspapers now carry advertisements for shopping malls in smaller cities like Dera Ghazi Khan, Sukkur, Sargodha, etc as well. The average Pakistani household is very clearly more able and more willing to shop than ever before. The reasons for why women have entered the workforce are manifold. Education levels have been rising rapidly across the board. Fertility rates have dropped from 7.1 in 1980 to just over 3.1 in 2011, causing household sizes to decline. Women with fewer children have more freedom to pursue careers outside the home. And persistently high inflation may also have forced many families to consider being more open to women working outside the house: a second income can clearly go a long way in changing the fortunes of a household. It has clearly already helped the economy through a particularly difficult time. Procter & Gamble (P&G), one of the world’s largest consumer goods company, has recognised Pakistan as one of the top 10 emerging markets to focus investment in. This sounds like good news for our cash-strapped economy, and it is equally good news for those who have invested in P&G. It makes sense for any fast moving consumer goods (FMCG) to invest in a country where the world’s biggest consumer goods names – Unilever, P&G, Nestle and Mondel-z (formerly Kraft Foods) – are not only operating, but also growing significantly. According to the State Bank of Pakistan, the net profits of FMCG companies listed on the Karachi Stock Exchange grew in excess of 20% in fiscal year (FY) 2011-12. P&G, which is not listed on the KSE, has witnessed tremendous growth in revenues during the past three years – including 50% revenue growth in FY2012. Besides the consumer goods sector, its supporting industries like packaging and distribution companies have also seen their toplines grow significantly. So what are the factors contributing to this growth? If the fact that these companies are selling essential food items and consumer goods in the world’s sixth-largest market by consumer size is not satisfying enough for you, here’s a more detailed and nuanced explanation. “Economics and demographics are together at play in Pakistan,” P&G Pakistan Country Manager Faisal Sabzwari told this correspondent in a recent interview. The boom in the rural economy has also been a major contributor to their growth – thanks to a series of bumper crops of agricultural produce and wheat support prices, which were raised by the government in recent years. Besides this, according to Sabzwari, Pakistan is one of the top countries adding 20-somethings to its workforce; these are the people establishing families, getting new jobs and helping market sizes grow. “We have millions of consumers entering independent disposable income space in their lives every year,” Sabzwari said, while referring to the growing middle class. The market size in Pakistan has also grown in terms of volumes, without taking pricing into account. “Increasing urbanisation and the growing middle class are key drivers of the FMCG business,” Sabzwari said. Pakistan’s is urbanising faster than other developing countries, according to Sabzwari. “The country’s population is growing at under 3%, while the rate of migration to urban centres is even higher,” according to Muzammil Aslam, managing director at Emerging Markets Rsearch. “A population base of 180 million talented and hard-working people hungry for prosperity ensures that nothing can hold this country back from growing,” P&G Pakistan’s chief said. While looking at the growing middle class, he said, it is important to look at their consumption habits. “We are exposing more consumers to value brands like Pampers and Always,” he explained. It may be added here that consumer spending in Pakistan has increased by an average of 26% in three years, according to a Bloomberg report published on November 21, 2012 – a strong sign that people are consuming more goods than ever before. This rise in consumer demand has spurred the growth of supermarkets across major urban centres, which include, but are no longer limited to Karachi, Hyderabad, Multan, Lahore, Faisalabad and Islamabad.